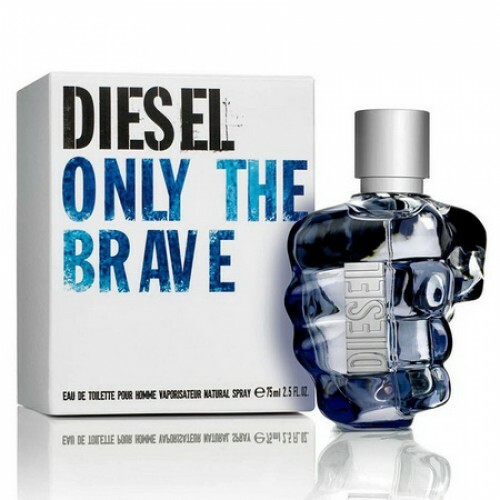 Diesel Only The Brave created especially for the brave, self-confident men. Diesel Only The Brave 75ml. Eau De Toilette is a unique fragrance and fresh. Perfume is for the man who is very sure of himself, he knows that is his goal in life, is honest with himself. A man who does not yield to failures and who gets worn and intuition. The fragrance opens with energizing citrus tones, with sweet notes of mandarin and coriander. The heart is very exciting, passionate hide notes of roses and lavender. Fragrance base notes contain a mixture of very sensual. Warm wood tones with the amber offers a cozy and masculine air. Diesel Only The Brave is designed to suit any situation. Men's fragrance Diesel Only The Brave creative and unusual. His issued trading house Diesel, which is always different interesting ideas and bold design solutions. One such creative solutions became bottle of this fragrance. It is a representation of a clenched fist, which is crowned by a silver cap. Unusual design of perfume flavor a large popularity among the youth, as modern men prefer to buy only those flavors that trendy and stylish in a certain period of time or they are quite exclusive. Top notes: Amalfi lemon, mandarin, coriander note "Hearts": frankincense, rosemary, code, styrax Final note: amber, cedar. It is a unique and refreshing aroma. It symbolizes confidence and connects opposites. Only The Brave fragrance is for men who know how to choose the right direction in life, be its goal and be true to yourself. Never give up without fear are guided by intuition. Energizing scent opening chords of fresh citrus, sweet mandarin and coriander significant. At the heart of the captivating perfume hides precious labdanum, passionate and magnificent lavender roses. The base scent is a sensual blend perfectly the essence. Warm wood tones and feel Ambra gentle touch and intimate power. Manly perfume Diesel is specifically designed for each situation. With the scent of Diesel Only The Brave you will finally be yourself!